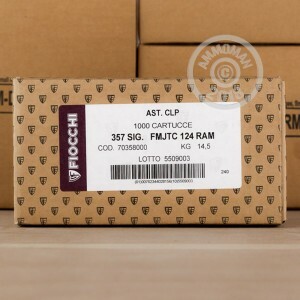 This 1,000 round case of Fiocchi ammo, packaged in 20 boxes of 50 rounds each, is a great option for shooters of the .357 SIG cartridge. It uses a 124 grain full metal jacket bullet and achieves the typically high velocities of the .357 SIG in pistols such as the Sig P226, Glock 31, or Springfield XD. 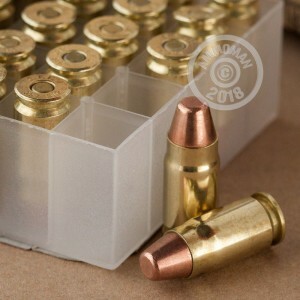 All of these rounds use non-corrosive Boxer primers and reloadable brass cases. 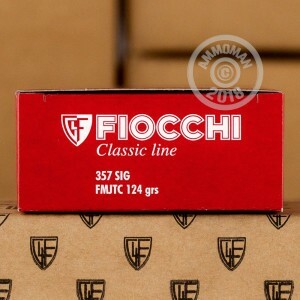 Fiocchi ammunition is known for delivering great quality at moderate prices. Although Fiocchi's main production plant is located in Italy, much of its US ammo is loaded in Ozark, Missouri. Grab this case to take advantage of our free shipping offer for all orders over $99. It's AmmoMan.com's way of introducing extra transparency to the market and extra value for the high volume customer.